Storm Damage Tree Removal Ottawa - Crowe Tree Service Inc. Whenever there are major storms, the potential for the trees on your property to cause damage increases and the majority of the damage is caused by falling limbs or when the entire tree (or parts of it) fall onto vehicles, homes and occasionally on people. The reason that summer storms are soo dangerous for falling trees and limbs is because the soil is more saturated with water creating a situation where the tree roots can fail and also the high velocity winds can knock off weaker branches and even the entire tree with the right conditions. On the flip side, the winter storms are equally dangerous because the accumulation of snow and ice on the branches creates an off-balance that makes the tree more susceptible to being knocked over. If you have an older, weaker tree on your property then you may want to consider removing the tree before a major storm comes that could turn into a dangerous situation causing damage and destruction. If your tree has been impacted by a passing storm already, we can help with tree and limb removal after the fact also. Hopefully there wasn’t any damage (aside from what happened to the tree) but either way we are here to help with your Ottawa tree removal. Most of the time it is hard to determine if there is a hazardous tree in your yard if you have an untrained eye. If you are unsure, it is best to call us to have a professional tree removal specialist take a look to see if your tree poses any danger during the next storm that sweeps through Ottawa. The tree would be assessed during a climbing inspection and analysis of the decay and strength of the branches, stems and of course the roots of your tree. Depending on our findings, we may recommend a complete tree removal or a tree limb removal to make sure that you and your property are safe during the next storm. We would never recommend tree removal in Ottawa without reason. We love trees and appreciate the benefits they provide us in the world well beyond just the aesthetics and a cool place to swing from. After more severe storms, one of our first priorities is always to handle the emergency calls we receive to remove trees, clear roads and driveways. While we are available for the emergency tree removal moments, it is important to have your trees inspected periodically to determine if a danger is present and assess the strength of the tree so that you know if tree removing is required or if everything is good to stay as is. If after a major storm you see one of your trees leaning then it is very important to call us so that we can take a look and possibly remove the tree because a leaning tree is a sign that there is root damage and the tree will no longer be able to support itself. If it hasn’t fully fallen down then there is a good chance that the next storm (even if minor) can be the final nail in the coffin and knock down the tree. It’s a good idea to have these trees removed right away in these situations to ensure that you and your property are safe. 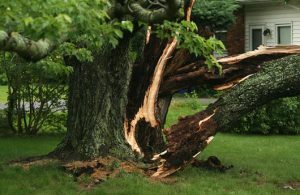 So when it comes to storms and tree damage, there is a lot to consider and it is better to be proactive with the tree removal rather than waiting for the major storm to knock down your tree and risk damaging your property. Give us a call to have a look at the trees on your property today to keep you and your family safe.